Upon finishing his studies, Lucas has been enjoying a diverse career teaching and performing/recording both classical and mainstream music. He has served as mentor and coach for The Oakland Youth Orchestra and Summer Music West. 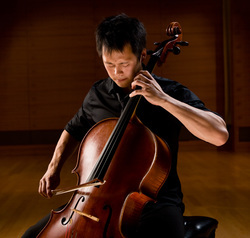 He is principal cellist of the Bear Valley Music Festival and will be a featured concerto soloist in August of 2016. ​Equally passionate about mainstream music, Lucas has performed/recording with such artists as Death Cab for Cutie, Sting, Train, The Trans Siberian Orchestra, Quartet San Francisco, Hillary Hahn, and for numerous movie and video game soundtracks. A lover of the great-outdoors, Lucas and his wife, Mai, are avid backpackers and enjoy kayaking, hiking, and travelling. In addition to being a resident teaching artist at Alameda String Academy, Lucas is the music teacher/director at Northcreek Academy in Walnut Creek, where he lives with his wife and their cat, Gizmo and dog, Waffles.